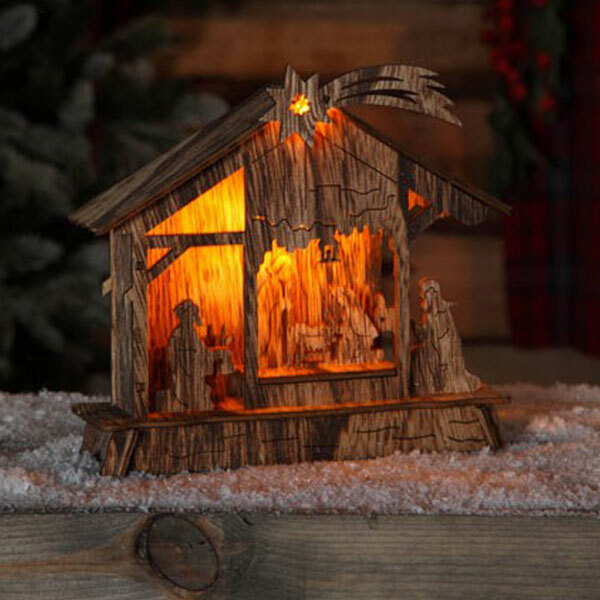 Noma LED Lit Nativity Scene B/O in Natural Wood design, provides a delightful Nativity scene silhouette laser cut and illuminated as a Christmas centrepiece suitable for a mantlepiece, tabletop or bay window. Finely detailed wooden Christmas stable scene of the nativity, mounted and illuminated with 4 warm white LED lamps. Battery operated to make this Christmas Nativity ornament suitable for placement where mains power may not be available, ensuring no trailing wires. Noma range of seasonal wooden scenes are growing with popularity each year, making them collectable and warmly welcomed into the family home each Christmas.